Siemens and Jump Architects' aim was to create an innovation space within the German manufacturer's UK headquarters, The Crystal. The design was led by Jotta and the detailing and realisation of the concept enabled by Shape Studio. The Crystal is a sustainable city initiative by Siemens, home to the world's largest exhibition on the future of cities, as well as one of the world's most sustainable buildings and events venues.The aim for the space was to facilitate meetings between Siemens and their clients, and to showcase the company's IoT platform, MindSphere. The ambition with the design was to reflect the bold architecture of The Crystal's exterior while also surpassing the strict environmental standards that the The Crystal imposes. Responding to these challenges, Jotta utilised an innovative honeycomb composite material that can be thermoformed to a radius. 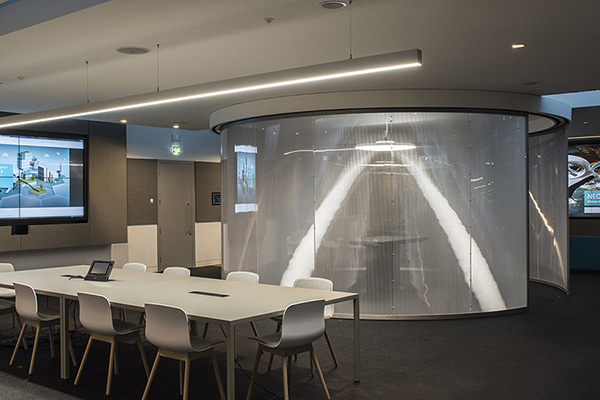 Bencore, a lightweight and light-permeable panel was selected to create the movable curved partitions. The curved panels are joined with clear connections to minimal visual impact without the need for metal framing. 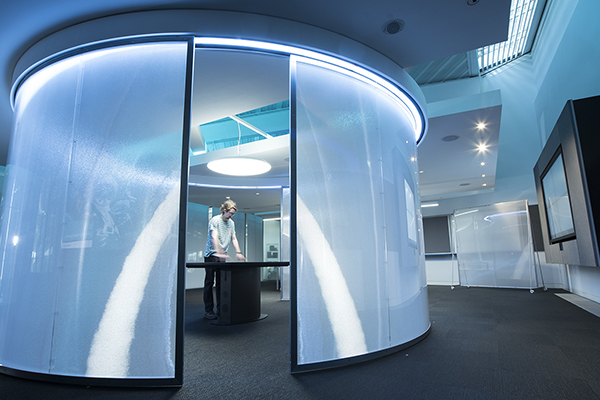 Shape Studio came up with a complex track system that holds two sliding screens within a very tight space - the curved screens can simply be pushed with one finger around the entire circle or left open for a semi-circle.